Claudine Longet on The Bold Ones. I recently watched a 1969 episode of The Bold Ones: The Lawyers called "The Rockford Riddle." 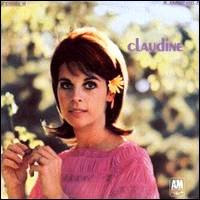 It guest starred Claudine Longet as a woman accused of murdering her husband's mistress. Anyone who remembers the French actress/ singer will recognize the irony immediately. Eight years after this episode, she would be tried in a Colorado courtroom for reckless manslaughter in the death of her lover Vladimir "Spider" Sabich. Claudine Longet was born in Paris in 1942 and became a dancer at age 17. The demure beauty was trying to make it in Vegas when she caught the eye of entertainer Andy Williams. She was almost 20 and he was 34 when they married in 1961. Williams was already an established star, having scored several top ten hits and a chart-topper with 1957's "Butterfly." He launched his long-running NBC TV series The Andy Williams Show in 1962 and Claudine made frequent appearances alongside her husband. Her voice, often described as girlish and breathy, was certainly distinctive, but she failed to score a hit single in the U.S. Her highest-charting single on the Billboard Hot 100 was "Love Is Blue" in 1968, which peaked at #71. Her albums fared better, with the self-titled Claudine reaching #11 and selling over 500,000 copies. 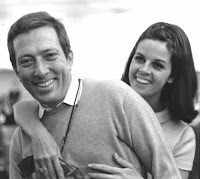 Andy Williams and Claudine Longet. She also branched out into acting and made guest appearances on TV series such as Hogan's Heroes, Run for Your Life, The Rat Patrol, and The Name of the Game. Her most successful theatrical film was Blake Edward's silly, but funny The Party (1968), which paired her effectively with Peter Sellers. Offscreen, she and Andy Williams had three children and became close friends with Robert and Ethel Kennedy. They appeared to be a blissful couple, but the marriage fell apart in the late 1960s. They separated in 1969 and divorced six years later. 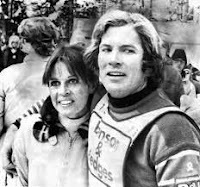 By 1976, Claudine Longet had moved in with her boyfriend, American skier Spider Sabich, in Aspen, Colorado. The grandson of Croatian immigrants, Sabich finished fifth in the slalom in the 1968 Olympics. After a moderately-successful career on the World Cup circuit, he turned professional after the 1970 season. Good-looking and charismatic, the popular Sabich won several professional championships and made a good living off endorsement deals. He and Longet met at a celebrity-pro benefit in 1972. On March 21, 1976, Sabich died from a gunshot wound to the abdomen. Various sources have different accounts about what happened on that afternoon. Most claim that Longet said Sabich's .22 caliber handgun accidentally discharged while he was showing her how it worked. After a police investigation, Longet was arrested and charged with reckless manslaughter (which carried a maximum penalty of 10 years in prison). She hired L.A. attorney Charles Weedman and Aspen lawyer Ron Austin. The trial drew national attention. Andy Williams supported his former spouse throughout her four-day trial. Evidence, to include a diary and blood and urine tests, were ruled inadmissible (police confiscated the diary without a warrant). After less than four hours of deliberation, the jury found Claudine Longet guilty of criminal negligence. The judge sentenced her to a $250 fine and 30 days in county jail, which did not have to be served consecutively. Sabich's family later filed a lawsuit against Longet, but it was settled out of court. According to some sources, the settlement contained a proviso that she could not write a book about Sabich. Longet and her co-defense attorney Austin married in 1985 and currently live in Aspen. She will turn 74 in January. Although Claudine Longet has kept a low profile over the years, she has remained a fixture in pop culture. Mick Jagger wrote a controversial song about her called (appropriately) "Claudine." It was pulled from the Rolling Stones 1980 album Emotional Rescue, but later appeared on a deluxe version of Some Girls. 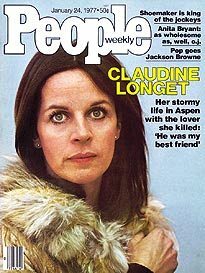 And in 1975, Saturday Night Live did a skit abut a skiing competition called the Claudine Longet Invitational, in which the skiers were "accidentally" shot by Longet. After receiving a cease-and-desist order, SNL producer Lorne Michaels issued a formal apology on the show the following week. For more information on Claudine Longet's trial, you may want to seek out True Crimes: Celebrity Murder Stories by Ryan White and the article "Claudine Longet: Aspen Femme Fatale," which was published in a May 2013 issue of the British edition of GQ magazine. Whoa! This is pretty juicy stuff. I had never heard of her before, but I am listening to "Love is Blue" on YouTube right now. I wonder if she would have had a more promising career if she came on the scene now, vs. in the 1960s? She was the wife of America's favorite singer. That's the only reason she even had a recording contract. I remember her appearing on 2 episodes of McHale's Navy and in the 1964 McHale's Navy movie. This was a fascinating case. It would have been interesting to learn the verdict if the evidence had been obtained properly and had been admissible. Thank you for sharing the details.